We had a wonderful time at Sigiriya and Minneriya National Park and were ready for our jam packed second day in Sri Lanka. Although we had a tight schedule, with Sanjeeva’s excellent planning, we were able to do everything on our itinerary and not feel rushed. Let’s just say he did some expert driving! Day 2 started with a visit to Polonnaruwa, which has had a tumultuous history involving a lot of fighting and murder. Apparently this place had some bad bad mojo. When we arrived to the ancient city, PL tours had arranged an awesome guide for us. The guide was very knowledgeable and answered all of our questions. We started off the tour by going through a museum and learning some history of Polonnaruwa. 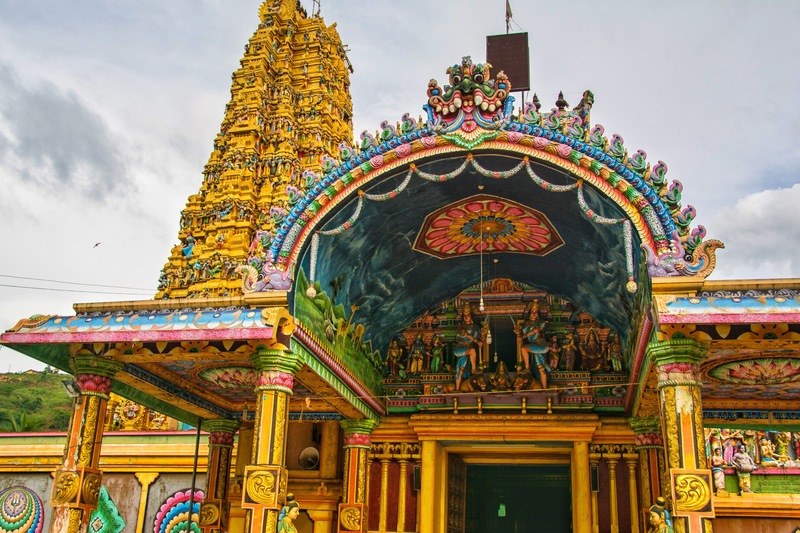 The city was the second capital of Sri Lanka after Anuradhapura, the majority of the city as built by the 2nd king. During the time the city was was the capital, the 3rd, 4th and 5th kings were all murdered there in the city. Because of this, the 3rd king’s brother, who lived in India, came to Polonnaruwa to burn the city down in revenge. The city is quite large, so we were very happy that we had a driver to take us to each of the sites and waited to pick us up after we were done. The ancient city is really beautiful as there are a lot of really interesting structures. I definitely think the guide made a huge difference, just going through without someone explaining to you the nuances will have you missing out on a lot. A few of the interesting things we learned about were the four positions of Buddha: enlightenment, teaching, contemplating suffering of others, and passing away. There were 4 buddhas to demonstrating each of these positions. As you walk around, you will also see a ton of monkeys, they scared us a few times as they went flying past our heads on low hanging branches. You will also see them just relaxing all over the place and just snacking on fruit. The ancient city has quite a few temples, but make sure that you are wearing long pants and that your shoulders are covered or you won’t be allowed admittance. Lucky for me, our guide procured a wrap from a local for me and I “donated” 100 LKR to him so that I could visit the different areas. You will also be asked to remove any hats and shoes before you enter the temple areas. My favorite structure we saw during our time at Polonnaruwa was the Lankatilaka temple, which had beautiful carvings in the walls and also an enormous standing Buddha inside. 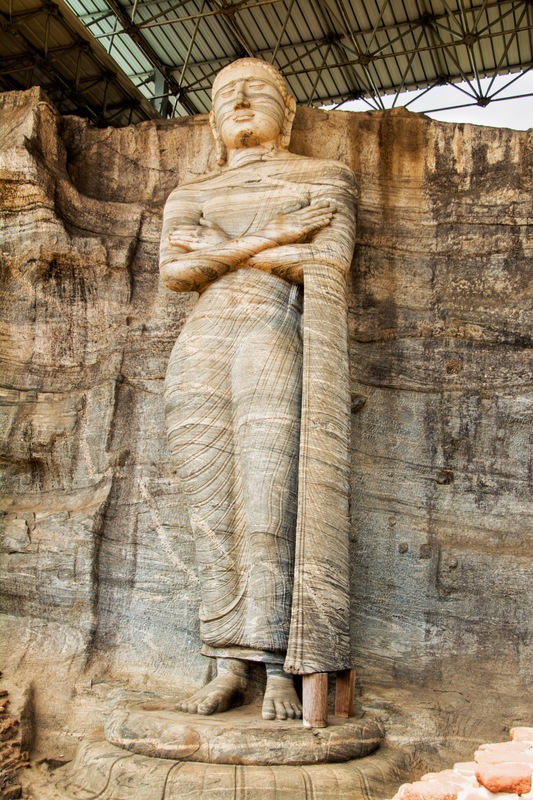 Polonnaruwa is definitely a site not to be missed while you are in Sri Lanka. After the tour of the ancient city, we stopped at one of the food stands to get a cold drink. Sangeeva also gave us a lentil cake (Dal Vakai) for us to taste, it was soooo good, like a really nice falafel. It was hot and crispy on the inside, but tender on the inside. Sorry I don’t have a picture because I basically inhaled it…. Our next stop was to Dambulla Caves. Our driver dropped us off at the entrance and as we proceeded to climb up the steps, we saw people going towards a “shoe drop off” shack that was run by two older men. For 25 LKR they would keep your shoes safe for you while you went inside the caves. The buildings are literally built into the walls of this mountain and there supposedly 80 different caves in this area. The section that we were allowed to enter consisted of 5 caves. Each cave has statues and/or paintings of Buddha and you’ll see a couple hindu gods in there as well. As you can see, the paintings and statues on the inside are quite beautiful and unexpected from the looks of the entrance. Word to the wise, don’t eat while climbing up or down from the caves. We saw an Australian girl get jumped by a monkey because he wanted her empty ice cream cup. He definitely knew that a cup was supposed to have food in it and would not relent. The girl ended up throwing the cup at the monkey, which was a terrible idea as well since he ended up gnawing on the cup. We tried to tell her to put it back in her bag…..but you can’t help everyone. After the caves, we had worked up an appetite and were ready for lunch! 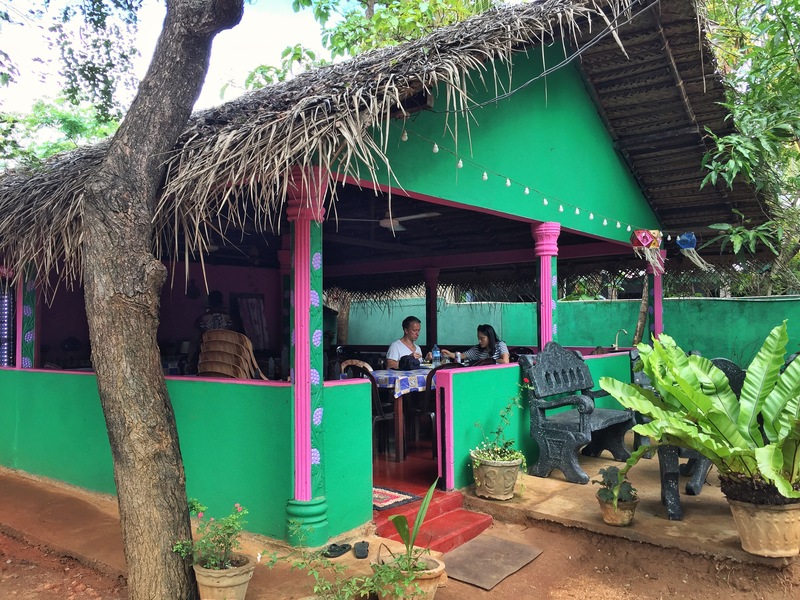 Athula restaurant was very cute with its bright colors and palm frond roof. 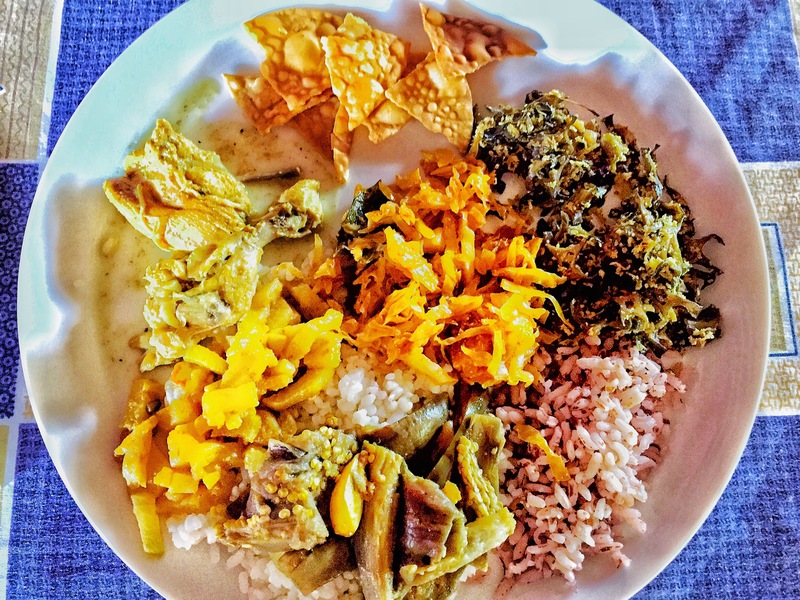 Lunch was served buffet style (1,400 LKR/per person) and there was a variety of curried vegetables to choose from as well as a curry chicken dish and rice and pappadum (which is the fried tortilla chip looking things). Everything was really tasty, my favorites were the delicious okra, cabbage and green beans. I went back for seconds on those! Our Kandyan dancers show was scheduled to start at 5:00 PM, there are a ton of people going to the show including quite a few tour groups. Sanjeeva had made sure that we had a front row seat reserved, so we arrived right as the show was beginning and had very good seats. The show consisted of a variety of acts, from dance, musical instruments, comedy to fire dancers. The most interesting acts were this man who took this spinning discs and balanced them on various sticks all at the same time. You could literally see the beads of sweat developing on his brow. And of course fire dancing is always a big WOW event. They definitely did some impressive things with the fire. Overall the show was interesting and worth a visit if you have the time, but if your schedule is already packed and there is no time, I would skip the show. 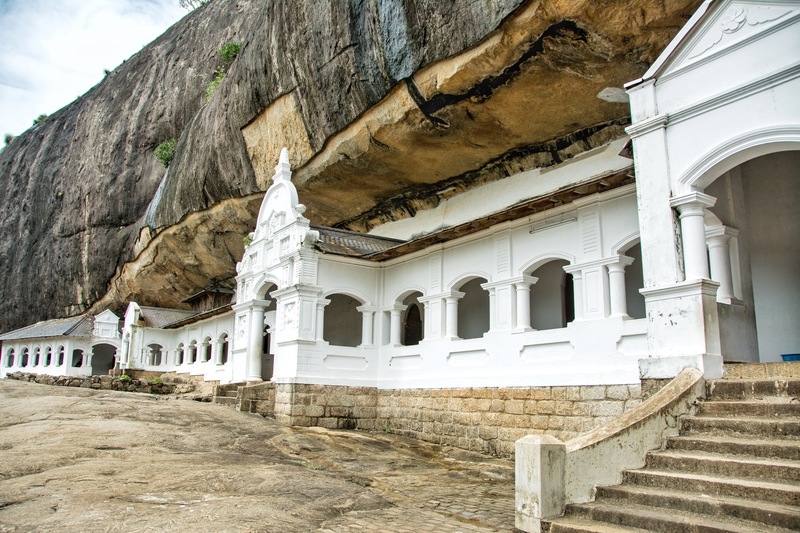 The Temple of the Tooth is right next to the Cultural Center where the Kandyan Dance is. Right after the show, we were taken to the Temple and ushered to the “shoe rack counter” so that we could check in our shoes. This is required before you are permitted entry into the temple. I hope you’re starting to see a theme developing here. PL tours once again provided a guide for us. The guide was very much in a hurry to get us around, and I didn’t really get much information from him. The reason for the rushing was that certain rooms are only open for a short period of time each day. I appreciated that he wanted to get us to all of the rooms before they closed but I very much felt like herded cattle. So what did we learn while we were in this temple? Well, this is where the actual tooth relic of Buddha is kept, which means this temple houses one of Buddha’s actual teeth. We were able to see the original casket that holds the relics and were told that the tooth comes out only once every 5 years. 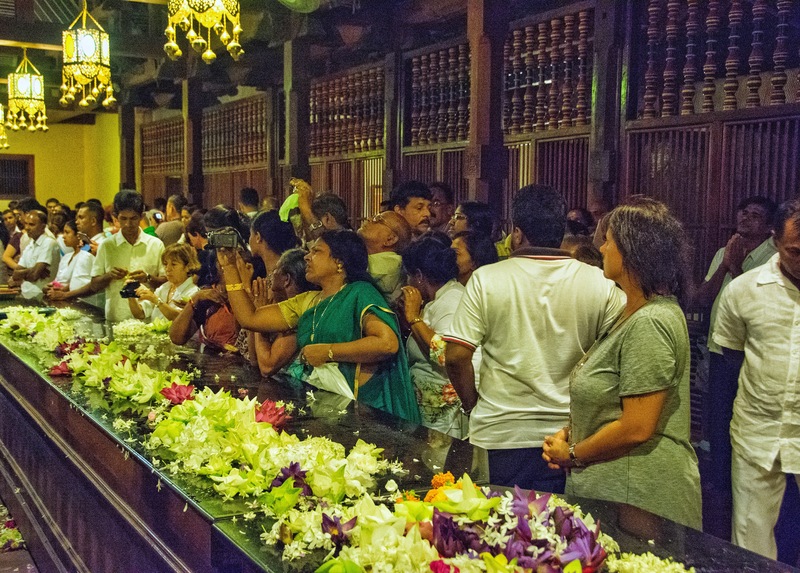 The casket room is only opened 3 times a day for worshippers to come and pay their respects. As soon as the room opened, there was a rush to visit all the special rooms. 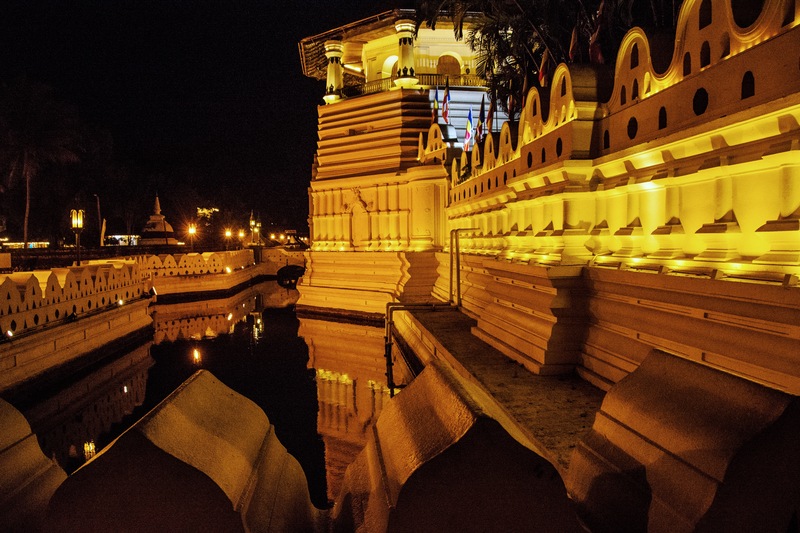 The temple itself is very ornate and I enjoyed watching the locals, who were very dedicated in paying their respects. So after our jam packed day, we headed to our hotel, the Grand Kandy Villa to get a shower before heading to dinner. This was the most luxurious hotel that we stayed in the whole trip! The room was enormous and there was great water pressure and it was even hot! Thank goodness for “big” cities! We were very pleased. For dinner, Sanjeeva wanted to take us to a local restaurant that he said was very popular and tasty. He said that the owners wife was also Chinese and that he thought I reminded him a lot to her. The restaurant is located a little bit outside of Kandy, but it is on the top floor of the building so you have a really nice night view of Kandy and there was a lovely breeze. We had a reserved table and there were a lot of tourists and locals alike. There are a wide variety of selections available on the menu, so there should be something for everyone. Mostly people come here for the vibe and the views. The restaurant also has pool tables and a DJ on some nights. You’ll also get to meet a cute puppy or two as the owners’ two dogs are mainstays of the restaurant and seem to like their role there. They pretty much keep to themselves and are very friendly, you can tell that they have grown up living the restaurant life. So you’ve read about all the great things we did on day 2, but I would be remiss if I didn’t provide you with a few suggestions on what we would skip for sure if we’re planning a trip. As part of our tour, we were taken to Spice and Herb Old Town 27. They start by giving you a tour of all the plants and showing you some spices and tonics. Then they offered us a “free” 10 minute massage (all you have to do is tip), but the massage is done outside, Scott had to take off his shirt to get his massage, and I just got a foot and arm massage. For us, it wasn’t really enjoyable and it was very awkward. I ended up looking at the their shop and bought some curry for 600 LKR and the vanilla for 800 LKR (the prices were really over inflated). I definitely did not think that this stop was worth the time or money and wouldn’t recommend it. 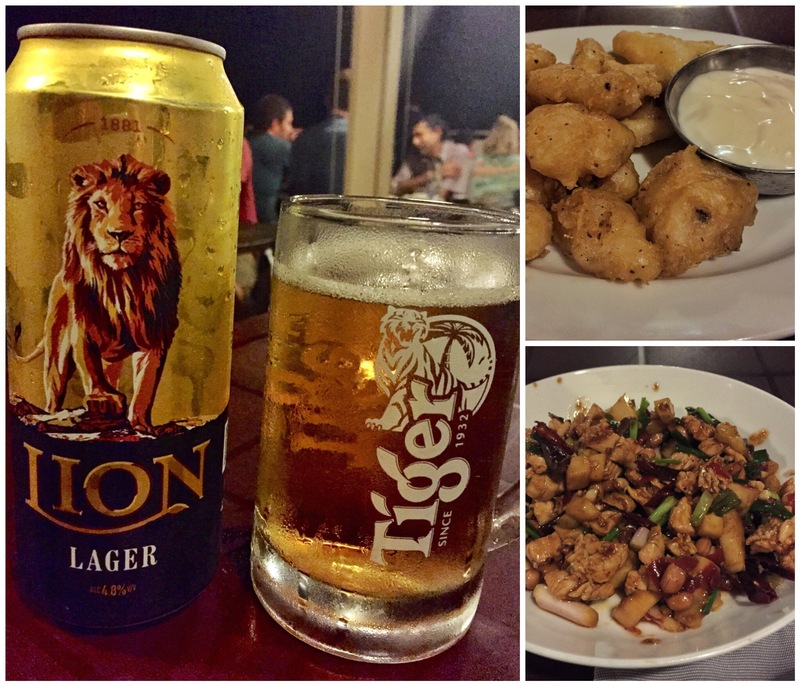 After dinner, drinks, and a game or two of pool with the locals it was time to end another great day in Sri Lanka. We were excited to get some rest and explore more of the country on day 3!